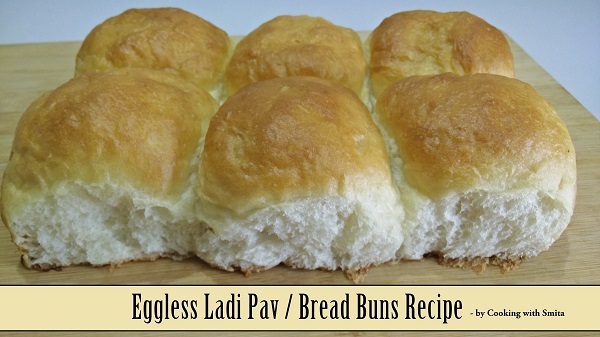 Simple and easy step by step recipe of Eggless Ladi Pav / Bread Buns. Yes, you can easily make Soft and fluffy delicious Pav at home. Follow this step by step recipe to make softest homemade Laadi Pav, the basic ingredient of scrumptious dishes like Pav Bhaji, Dabeli, Vada Pav, Misal Pav etc. Take ½ cup milk in a bowl, add 1 & ½ tbs. Powder Sugar, Dry Yeast and mix well. Cover with lid and keep aside for 15 minutes. In a large bowl, add All Purpose Flour, Milk Powder and Salt. Mix well all 3 ingredients. Add milk in small portions and prepare the sticky dough. Take a large plate with flat surface and grease with Butter. Add 2 tbsp Butter and Dough. Knead the dough for 10 – 15 minutes. You can knead it on kitchen platform too. After 10 minutes, sprinkle some All Purpose Flour and make a smooth dough. Grease a bowl with butter and shift the dough in it. To rise the dough, cover it and keep aside for 30 – 35 minutes. The dough will rise and double or triple in size. Apply some butter on your hand so that dough will not stick to your hand, and start punching the risen dough. Again knead for 2 minutes on a flat surface. Divide the dough into 9 equal portions. Grease a baking tray/cake tin with butter. Roll dough parts and make round shape balls, place them on a greased tray. Keep some space between balls. Keep in the microwave for 35 – 40 minutes so that they will rise. DO NOT switch on the microwave. After 40 minutes, gently brush the buns with milk, DO NOT press the buns while applying milk. You can add Powder Sugar in milk, it is optional. Preheat microwave at 180 degree Celsius. Bake on Convection mode at 180 degree Celsius for 35 – 40 minutes. Remove from microwave and brush the buns with butter. Let it cool down to room temperature. Homemade Eggless Ladi Pav / Bread Buns are ready to eat. Preheat microwave/oven for 5 minutes. Switch off the oven and keep dough inside the microwave.